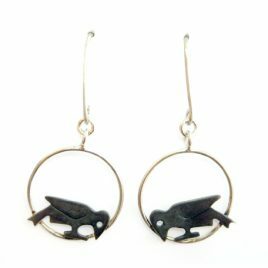 Becky’s work has always had a strong illustrative feeling. Designs develop from drawings; both observational and imagined or through a desire to express concepts and ideas around connectedness, relationships, and our place in the world. 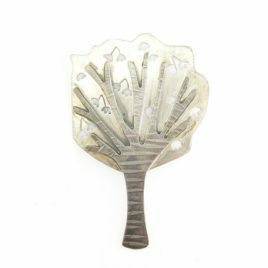 There are areas of narrative captured in silver and transformed into miniature scenes telling out across a brooch or hanging in a pendant. 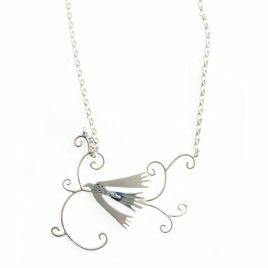 Her hope is that people recognise their own story in her jewellery. Becky works with sheet silver and copper with gold for detailing. 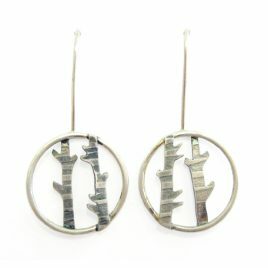 The metal is then pierced out textures and patterns are then applied to the surface using a rolling mill and templates. These components are then layered together and soldered. 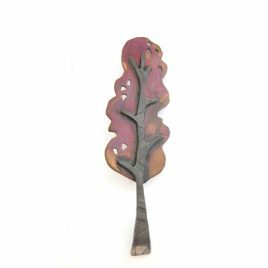 The pieces are finished with a mixture of matt, polished and oxidized surfaces to add tone and depth. 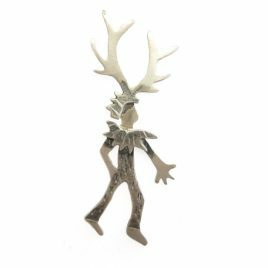 View cart “BCBR-17 Wild Thing Stag Brooch – Becky Crow” has been added to your cart.